The start of this adventure starts with me being sucked into an evening of scrolling Pinterest. Shocking I know. Now I had never thought of reusing pill bottles for anything. I mean really it sort of makes sense but it really isn’t one of those things that everyone does (unlike cookie tins for sewing supplies). I kind of liked the idea of making them pretty and to be honest the bobby pin problem in my purse was out of control. I had just refilled some of Penny’s heart medications and bought a new bottle of Advil so it was a good time for me to test this one out. At this point I started going through the various pins I found trying to find instructions, tips, anything to help me out. Almost all the pins I found went to images only or were a link on a blog that linked to something else that just seemed shady. So I just looked at the various pictures, grabbed an assortment of materials from my stash, and got to testing. Some methods worked better than others, one bottle I just tossed because it looked awful in the end. 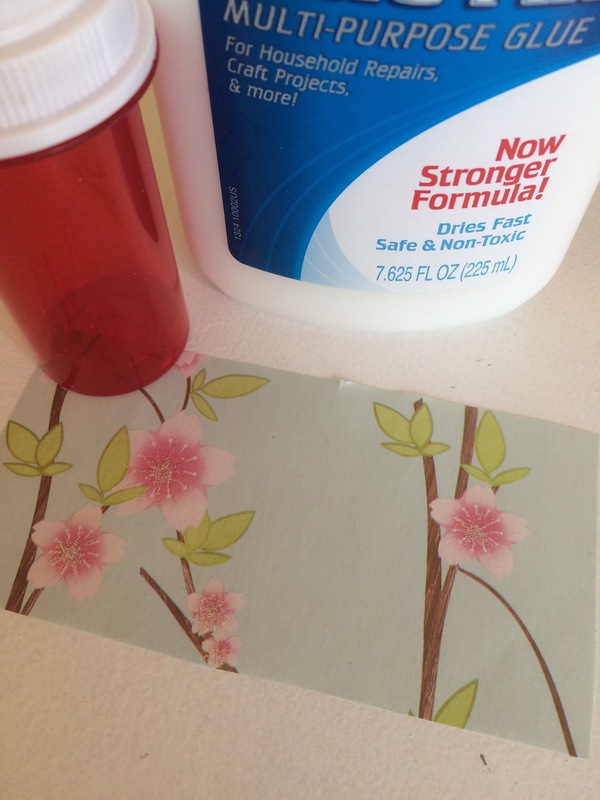 Without further babbling, here are some tips and tricks for repurposing medicine bottles! I cut out equal length strips of tape and slightly overlapped them as I wrapped them around the bottle. Starting at either the bottom or the top is easiest as you can line up the tape to make sure it is even. I had some very pretty paper leftover from presents ages ago, but really enough to use for most presents. I am not really sure why I did keep it all these years but hey it finally got used. Now this method works well enough with Elmer’s Glue but to be honest it would work better with a glue stick. I had trouble getting the layer thin enough so my bottle has some ripples in the fabric where the main lines of glue were. For this method, simply cut enough paper to fit around the bottle with about a quarter inch of overlap. I merely cut this one to the width I needed and then trimmed down the length once it was glued on. On both the bottles I have kept I used ribbon or yarn to hide seams and edge the bottles. 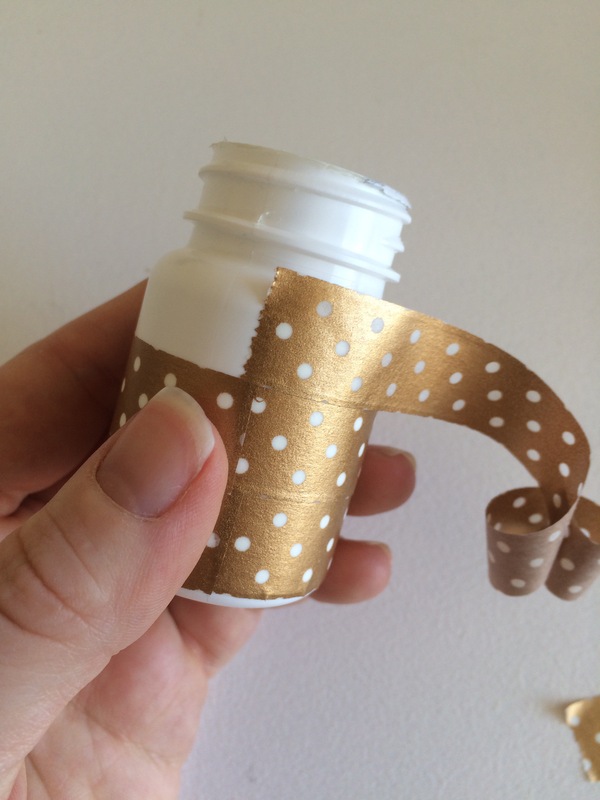 Simply place a dot of glue at your starting point and slowly wrap the piece around the bottle. I did one or two dots of glue at a time about half an inch apart. 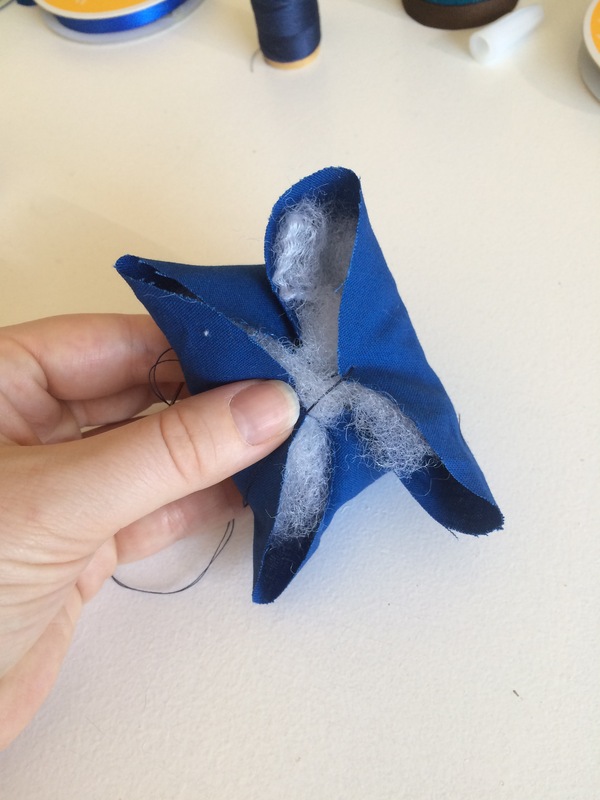 If you go much faster than that the glue will be too try to hold onto the ribbon or yarn. This method could be used to go all the way up the bottle but I limited my use to the bottoms, right underneath where the cap goes, and on the cap itself. The glue soaked through the fabric and discolored it leaving these ugly little lines. Even an hour later the fabric still looked wet but was really just crunchy at the glue points. One of the bottles I made now holds the bobby pins that collect in my purse along with a spare hair tie. Really it is sort of an emergency hair kit for those days I just can’t stand having my hair down anymore. The second bottle holds the ear buds I keep in my purse. Not only does this keep them from getting tangled but it makes them much easier to find. Other uses could be as a mini-medicine kit (think allergy pills, pain meds, antacids, etc. ), change holder, or a sewing kit (to hold needles and pins or stitch markers on the go). 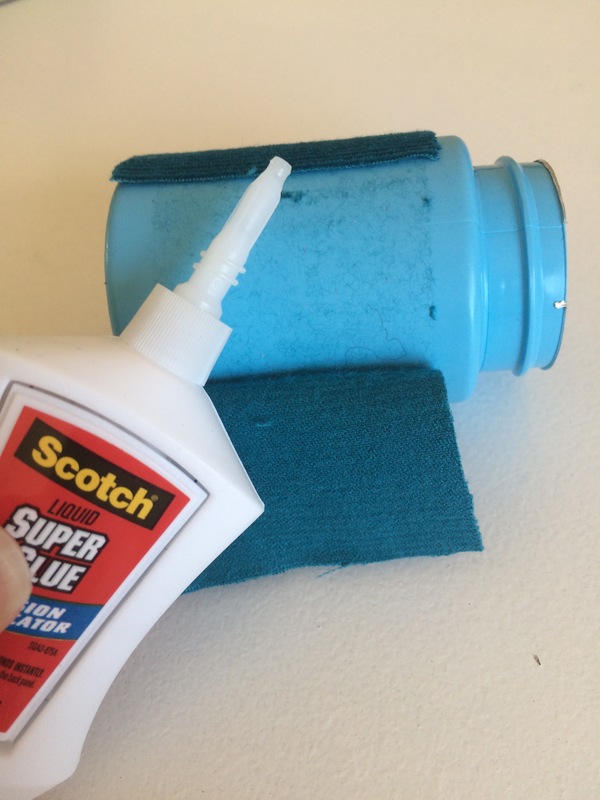 I did turn the top of the bottle I tossed into a pin cushion by wrapping some batting in fabric and sewing the bottom closed. Using hot glue I then affixed the puff to the cap. It has been handy for those jobs that require lots of stopping and starting.